Last weekend I attended this year’s Westminster Conference on Science and Faith, and every time I go, it turns out to be a real treat. 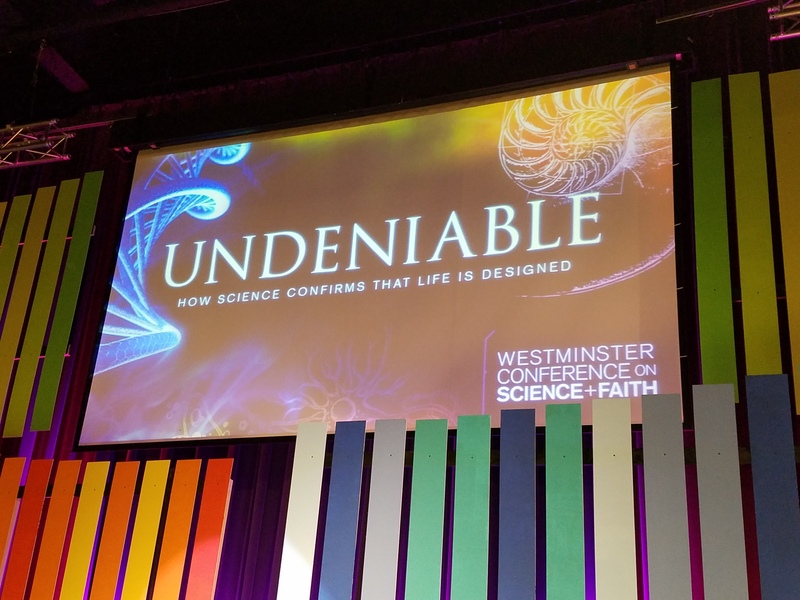 This year’s theme was ‘Undeniable’, positing the belief that science, when properly understood, confirms that life was designed and wasn’t an accident of time and chance. The first speaker was Vern Poythress, Ph.D. He has six earned degrees, including one from Harvard, and has published many books on philosophy, science and the Bible. Dr. Poythress had several presentations over the course of the conference, and the first one was titled, Design and Origins- what to look for. He began by asking the question, ‘Why is science possible?’ I’ll provide a synopsis of this topic. In order to answer his question, he set the stage by examining various philosophies. The first was the ancient Greek philosophy of science; they maintained polytheistic religious views. Accordingly, they believed the laws of nature could change on a whim. But such views of the world destroy confidence in science. Then he examined philosophical materialism (physicalism)- the metaphysical view that there’s only physical or material substance in the universe. This idea denies spiritual substance. And because of this, he argues, it can’t explain the origin of laws. Why is there something rather than nothing, or why are there any laws at all? Next, he considers postmodern relativistic subjectivism, a philosophy characterized by skepticism and a suspicion of reason. They deny there’s anything objective about reality, so reality can’t be objectively true or false. Everything is relative and not absolute. Rationalism is another philosophy, and it implies that everything originates with reason. Appeals to reason are a source of knowledge. Poythress argues that we need harmony in order for science to work. The universe and laws need to operate consistently, and we need to be able to understand them, and it is God who provides the way for science to be possible. He asks, “How do we recognize design?” and proceeds with Scripture that makes it apparent that God designed everything in such a way that we are able to discern his design simply by observation. Design is obvious when we look at a watch, a building, a car, and even a paper clip. But Psalm 19:2 indicates that we can also see design in nature: “The heavens declare the glory of God; the skies proclaim the work of his hands. Day after day they pour forth speech; night after night they reveal knowledge.” And this appears to be true. Whenever I’m surrounded by nature, I marvel at God’s creation and realize how everything exists for mankind to, not only exist, but thrive. There’s purpose behind this. The atmosphere is designed to protect us from the sun’s destructive rays, clouds provide rain for crops and cleanses the earth, trees provide food and resources, there’s an abundance of water, and there are plenty of renewable natural resources. I’m in awe of this creation, and if we contrast the earth with every other known planet, we can see just how special our planet is. There’s nothing else like it. All other planets are dead and are not equipped to sustain life. Poythress acknowledges that some people don’t (or won’t) recognize this, but instead they suppress the truth and resort to other philosophies to satisfy their sensibilities. Poythress then turns to experimentation and distinguishes between experiments that can be repeated vs. those that cannot (because they were unobserved, one-time events). Experiments can only be conducted in the present, and then repeated. Such repetition looks for regularity. Experiments that can be repeated and produce consistent results can be relied upon, whereas those that cannot be repeated remain questionable. If some event or phenomena happens with regularity, it can be observed, and experimentation can be used to formulate conclusions, answer questions, and provide truth. Singular events- such as the origin of the earth, universe or life- are exceptional. They’re unrepeatable, so we can’t know for certain how or when they occurred. Therefore, in order to speculate on conclusions about the past, certain, unprovable assumptions must be made, and then we can conduct experiments to see whether or not they’re consistent. With first life, for example, how hard is it for time and chance to produce the information necessary to sustain it? Such chance cannot be predicted. Things like the formation of new salt crystals, however, are predictable according to natural laws and chemical reactions. But something like a single-celled organism is extremely complex, and we can’t conclude from any experiment how it spontaneously formed from non-living chemicals. It must be assumed that, given enough time, it happened. No one has ever performed any kind of experiment to validate this assumption. Appealing to chance relies on faith, yet such faith rejects the possibility of God. But if we appeal to God by that same faith, then we have a rational explanation for the origin of complex information, and we know that God is in charge of everything. This was a valuable session because it set up the rest of the conference and laid the groundwork. It examined how different people look at the world and how they understand it. It considered our individual worldviews and biased assumptions we all use when utilizing science and its principles. As time allows, I’ll follow-up with some of the other sessions at the conference.